A manager of an information technology company yesterday admitted to assaulting an employee in 2013, which had caused a public uproar at the time when a clip of the incident taken by a colleague was posted on YouTube. Lee Yew Nam, 44, boss of Encore eServices, pleaded guilty to four charges of voluntarily causing hurt to Calvin Chan Meng Hock, 31, at the firm's Jurong Town Hall Road office. Other than his wife, Lee did not have any permanent employees and instead hired interns from universities and polytechnics, the court heard. In May 2010, Mr Chan started a six-month internship at Encore, and was paid $500 a month. When the internship ended, he continued in the job for the same wage. His duties included fixing customers' problems and configuring software. 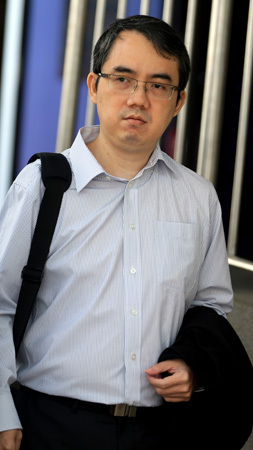 Investigations revealed that Lee would sometimes physically assault Mr Chan for making mistakes and scold him with vulgarities. Deputy Public Prosecutor Sarah Ong said that some time in January 2013, Lee felt Mr Chan had not arranged the software files in a computer neatly and slapped him. The following month, Lee accused Mr Chan of failing to answer a customer's request correctly, then punched him in the face several times and pushed him off a chair. On May 14 that year, Mr Chan and another intern Amos Yeo, 25, were in the office when Lee reprimanded the former for failing to delete some files in a database as he had been asked to do. When Mr Chan said he had forgotten, Lee grabbed his chin and pulled it back with force, saying: "Look carefully again, go through the folders and delete all the files that need to be deleted. Remember not to do this again." The next day, Lee checked the victim's conversation logs with a customer and felt he had failed to perform his work satisfactorily. When Mr Chan could not give a satisfactory explanation, Lee became increasingly agitated and shouted at him before punching him in the head. Lee then threw a punch at Mr Chan's head. Mr Yeo stood up and told Lee to calm down, but he continued to scold Mr Chan before slapping him in the face three times. Mr Yeo captured the incident on video on his mobile phone. Lee, represented by Sunil Sudheesan and Diana Ngiam, will return to court on Sept 14. He faces a jail term of up to two years and/or a fine.